This week has been a bit crazy. I’ve been seriously procrastinating at work, and had a bunch of things to do to hit a few hard deadlines before I headed off to Portland, Oregon for a few weeks (the place where young people go to retire). To get everything done, I had to pull a few long days at work. I would arrive at 8:30 AM or so and leave at 8 PM. This would be pretty standard in some industries (I’m talking about you, lawyers and I-bankers), but I’m usually home by 5 PM, and normally, I’m ready to leave work at 2 PM. So you would think that I would hate working late, especially considering I’ve struggled with finding meaning in my work and have been battling feelings of cynicism for quite a long time. But instead of being miserable, I actually enjoyed staying late and getting things done. What would account for this very unusual phenomenon? The Bhagavad Gita is a part of an ancient Indian epic called the Mahabharata, which tells the story of two factions of a royal family who go to war over who will accede the throne. The Gita is a portion of the story in which Arjuna, a warrior prince, is having an existential and moral crisis because he does not want to go to war against members of his own family. 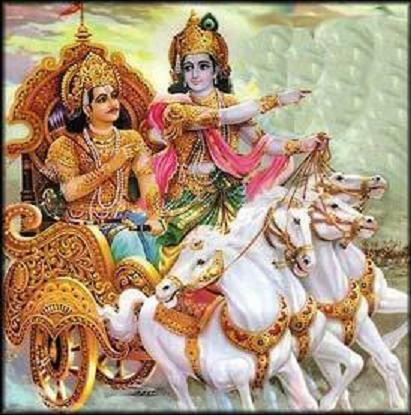 He seeks counsel from his charioteer, Krishna, who is an incarnation of the god, Vishnu. The Gita is a dialogue between Krishna and Arjuna, where Krishna addresses Arjuna’s questions about spirituality, life and death, duty, and other deep and lofty concepts. In the chapter titled “Karma Yoga,” or “The Way of Action,” Krishna advises Arjuna to fulfill his duty as a warrior for the sake of others. Though Krishna previously told Arjuna about the need to cultivate spirituality, he warns Arjuna that he cannot simply withdraw from his obligations as a prince and solider. This is a particularly interesting chapter for me because after studying and practice 5 ancient religions and philosophies, I’ve felt an increased desire to withdraw from the world and become a monk or some other sort of recluse. To avoid the consequences of fighting his family, Arjuna is considering a similar path in which he simply withdraws from this battle. Krishna says that is a terrible idea. Arjuna hopes to free himself by withdrawing from action, but Krishna says that he will not be free from his duty, that you cannot withdraw from your own nature. Here, Krishna points out that people need to take action just to survive. This makes sense, as of course, you need to work to provide for yourself. However, here Krishna introduces the concept of selfless action, meaning, action done for the sake of others. “At the beginning, mankind and the obligation of selfless service were created together. ‘Through selfless service, you will always be fruitful and find the fulfillment of your desires’: this is the promise of the Creator. The gods (or devas) are perfectly willing to help humans achieve their desires, but these gifts must be reciprocated with selfless action. Those who don’t reciprocate are thieves. This is incredibly counter-cultural to today’s attitudes towards work. Most of don’t view our work as duty, we view it as a means to achieve our personal goals (money, material goods, prestige, etc.). Our wants are the highest values, and most things should be done in service of those wants. Krishna goes on to describe the consequences of both selfless action and selfish action. This idea is difficult to accept. We’ve been conditioned to pursue our desires to achieve happiness (usually couched in phrases like “follow your passion), so to say that pursuing those selfish desires will mean you have wasted your life is very shocking. But these selfish desires didn’t originate in modern America, they have a deeper origin. “It is selfish desire and anger, arising from the guna of rajas; these are the appetites and evils which threaten a person in this life. Just as fire is covered by smoke and a mirror is obscured by dust, just as the embryo rests deep within the womb, knowledge is hidden by selfish desire – hidden, Arjuna, by this unquenchable fire for self-satisfaction, the inveterate enemy of the wise. Selfish desire is found in the senses, mind, and intellect, misleading them and burying the understanding in delusion. Fight with all your strength, Arjuna! Controlling your senses, conquer your enemy, the destroyer of knowledge and realization. Selfish desires lies in the senses, mind, and intellect, the things we usually associate with the self. But Krishan says that these aren’t the true self, rather, they are subordinate to the Atman, or personal soul, which is not really separate from Brahman, the universal soul. Though this is a bit confusing, what I take away from this is that all our likes and dislikes, our perceptions of ourselves as unique individuals, is false. When we say that we like or dislike our jobs, for example, this is merely our senses or mind or intellect talking. Because we think those feelings are synonymous with the self, we think we can solve our problems by focusing on the false sense of self, by quitting our jobs for example. The reason I think staying late was actually enjoyable was because it was, in a sense, selfless action. It wasn’t selfless in the sense that weren’t personal consequences for doing or not doing the work. There would have been. Contrast this with a normal workday in which I fall victim to selfish desires such as the desire to go home and rest, avoid unpleasant and boring tasks, etc. Those times when I focus on the distorted or false self (senses, mind, intellect), are also the times when I am most dissatisfied. I don’t mean to suggest that I was some sort of martyr by staying late, I wasn’t. It wasn’t a huge sacrifice, and there was some self-interest involved (not getting fired). But it did lead me to wonder that if, instead of trying to avoid unpleasant work, we should perhaps learn to view doing unpleasant work as a sort of symbolic sacrifice. Or perhaps we should do our work out of duty, rather than out of selfish desire. So instead of trying to get home early from the jobs we don’t like, maybe we should, instead, try staying late, and view our work as selfless sacrifice.